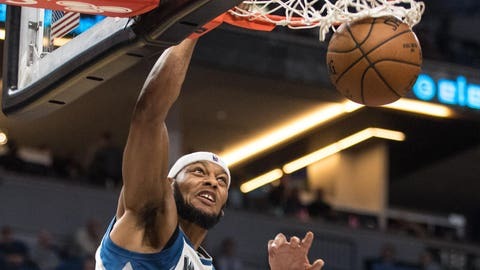 MINNEAPOLIS — The Minnesota Timberwolves say forward Adreian Payne is out indefinitely with a blood condition. The Timberwolves announced the diagnosis on Tuesday night. They say that Payne has thrombocytopenia, or low platelet count. The condition can cause bleeding, bruising and slow blood clotting after injury. Payne is receiving care from team doctors while recovering at home. The team says he has a good prognosis for recovery and can return to the court when that happens. The 25-year-old has played sparingly in his third season in the league. He is averaging 4.0 points in 12 games this season. Timberwolves coach Tom Thibodeau says the team’s primary concern is for Payne’s health.